I’ve had this entry in the pipeline for some time, waiting until I could find as many colors as possible before posting. This post is specific to the 4676 Portariviste, a future post will focus on the 4675. There are obvious similarities between the two. In 1971, Giotto Stoppino designed the 4675 Portariviste and 4676 Portariviste (magazine racks) for Kartell. Production began in 1972. They are constructed of ABS and feature an integrated handle approximately 7 cm in diameter for ease of lifting. The 4677 is a 1999 reissue of the 4676. The model numbers are about as confusing as they could be . The varieties and their sizes can be found in the table below. The manufacturing process is consistent with the era, it is an injection molded piece. The symmetry of the rack and the way the imprints are arranged on the bottom (rotated 180 degrees) hint that the tooling consisted of only a single lower and upper element. Two of these elements attached together comprise the magazine rack. 180 degree rotation of the imprint labels between components. Image source: eBay. Close inspection of the central area of the rack at the top show two small vertical rails, approximately 2.5 mm in length and 5 mm wide as shown below. When rotated these serve a glue points and some overflow is visible at the connection. I’d love to bust one of these open and get a look at how Stoppino managed the attachment process. Gentle tugging shows no give whatsoever between the components. 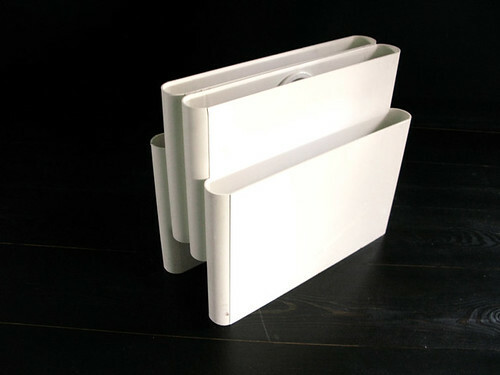 The Kartell Museum indicates that the 4675 and 4676 magazine racks were made in white, yellow, red, and black. They were manufactured in more colors than indicated. If you know of a color not represented below, please comment. I’ve counted/shown three different labels on this piece. We’ll see if there are any others that turn up. White Image source. Image source, eBay. Yellow Image source, eBay. A yellow rack (not this one, but still one in good condition) sold for AU$ 46 ($ 41) in Australia on 11/16/2009. Orange Image source. Item sold. Green Image source. Item sold in France on 10/28/2009 for 76 € ($ 109). Brown Image source: eBay user new_shankar. Black This one is mine. Goes well with black leather. The 4677 magazine rack was reissued by Kartell in 1999 in batch dyed and transparent PMMA. Current list price is $162. This is one case where the original is decidedly less expensive than the reissue, even for the uncommon colors. The 4677 rack (reissue) is manufactured in red, green, violet, blue, yellow, and straw. Promotional image for the Stoppino magazine rack reissue. Philippe Decelle, Diane Hennebert, Pierre Loze, L'Utopie Du Tout Plastique 1960 - 1973, 1994, p.55. Does the manufacturing origin have any deciding factor on price? Hi Peter: There can be a significant difference in price based on the color of the rack, with orange tending to command the highest price, with green and red close behind. In the 1970s through the mid 1980s, Kartell had several different production facilities around the world - some owned by Kartell; some contracted by Kartell (like Advance Industries or Winton Plastex in Australia, WCB Plastics in the UK, or Beylerian in the United States). These different manufacturing interests can lead to subtle variations within a color. For example, brown comes in distinct shades: one is a darker chocolate brown; the other more of a milk chocolate brown. There is typically no premium for the different shades, or different locations, but marks from more remote locations are uncommon.